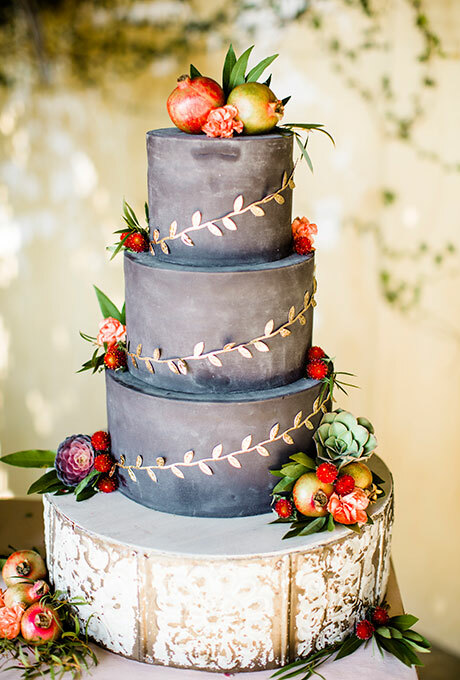 It’s not often that you think about a dark color of icing for your wedding cake color but this cake would absolutely work if you have bright fall colors as part of your wedding color scheme. Think about how gorgeous this cake would be with bright yet dark reds and orange hues. Your guests will definitely be wowed! 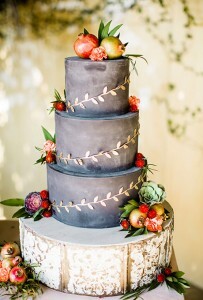 And I especially love the addition of the fresh fruit as the embellishment on the cake – there are still some bright colored apples available at this time of year. The golden leaves wrapped around the cake give it the perfect pop too!